I’d been keen to go to Hotel Imperial - the landmark at Janpath - ever since I read that the Queen of Netherlands had stayed here. It’s a lovely building – so rare in Delhi. Quoting the hotel website: ‘Built in 1931 by Blomfield; one of Sir Edwin Lutyen’s associates and inaugurated by Lord Willingdon in 1936, the Hotel is known for its contemporary colonial style’. In fact it is ‘a unique blend of Victorian, Old colonial and Art Deco styles.’ Oh, why can’t the current crop of Indian architects build something grand, instead of dishing out the horrible looking government buildings and the pigeonhole houses and flats that flood the NCR now. 1. The setting: 1911 isn't just an All Day Dining Restaurant. Named in honour of King Edward V's visit to Delhi in 1911, it's the Durbar Hall itself. Open high ceilinged spacious, grand. Walls adorned with framed photographs and etchings and lithographs of the visit to India in 1911. The waiters too look grand, with their red jackets. In no time you realise this isn't a pretentious restaurant of a factory produced 5 star hotel, but an ‘early 19th century English Manor' (again quoting the hotel website). 2. 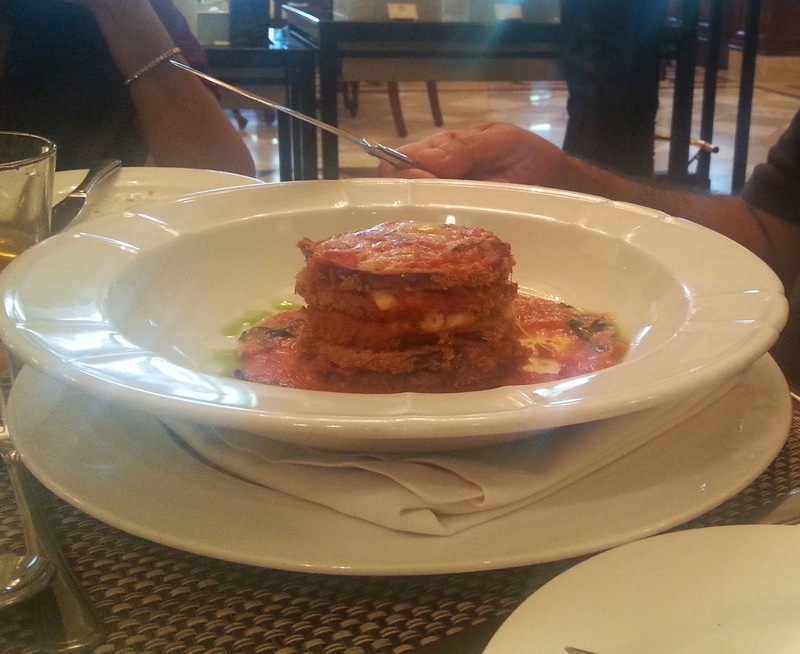 The food: The waiter graciously agreed to get the Melanzane Alla Parmigiana which was part of the menu from San Gimignano the Italian restaurant. Basically parmesan aubergine, its close cousin of the ratatouille. The baked eggplant dish was simply outstanding. It melted in the mouth leaving you fumbling for more. The thukpa – yes we went for a melange – was very decent though I’ve had better ones in Sikkim and Mcleodganj. But I’ve had many worse ones too.The grilled chicken was a bit tough and we had to send it back to be redone. When it came back it was just right and we dug into it with relish. 3. The money: It’s fairly priced, I’d say. Given the ambience, the quality of service and the food. All in all – its an experience worth repeating.